The Silva Slayer wins again! 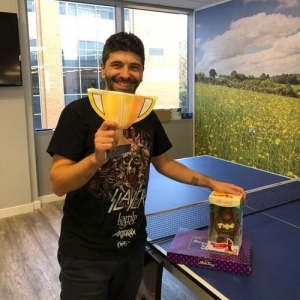 Well done to Ricardo ‘The Silva Slayer’ who for the second time took top spot as eTech’s Ping Pong Champ in our final match last Friday, winning the best of five rounds! Commiserations to runner up ‘Tornado Torin’ who also played a cracking game. 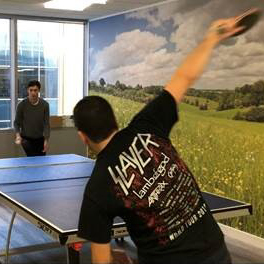 This was eTech’s third Ping Pong tournament and another fantastic event organised by Andy Baker, with many colleagues across the business taking part over the past couple of months. ‘The Silva Slayer’ ended the week a on a high, receiving his trophy and chocs! And to top off the event, there were pizza’s laid on for our hungry lot! !